As a competent stairlift manufacturer and supplier of stairlifts we guarantee for the high standard of quality of our lifts. We are there for you after the purchase as well - we guarantee a quick, competent service by our friendly and qualified technical staff. 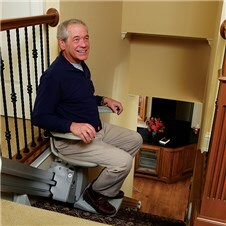 In designing the Hawle stairlifts we make no concessions as far as convenience, practicality and safety are concerned. The innovative construction and the materials used ensure that a maximum of quality and reliability is being realised. By means of safety sensors the lifts will stop immediately in case of an obstruction appearing on the stairs. Our Stairlift gives a lot of people the opportunity despite health restrictions to live at their familiar surroundings. At this it is immaterial if the existing staircase is straight or winding. We are able to build your perfect solution. 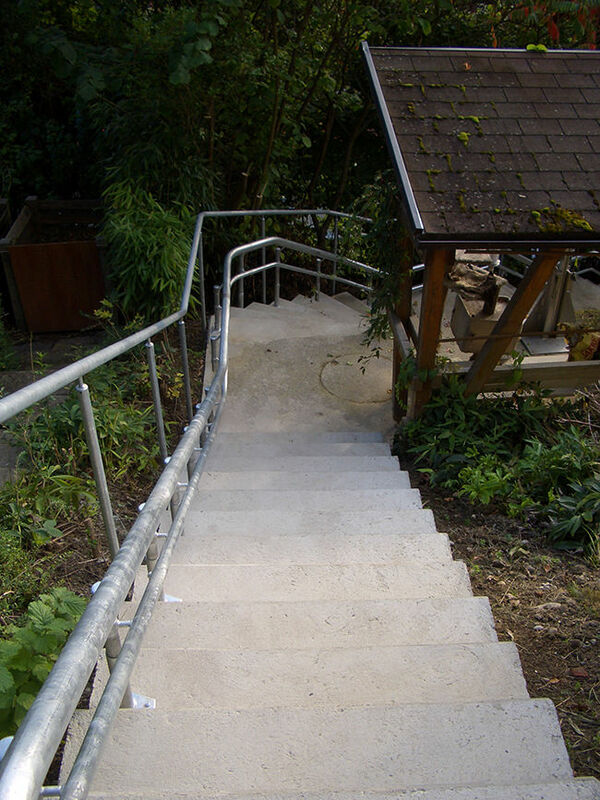 This is the reason why we produce a customized lift for your staircase. And this installation is also optically adapted to fit the best way to your personal setting. The upholsteries and even more the rails are selectable in many colors. Difficult structural conditions are also no problem: if old or new building – a HAWLE stairlift conquers even steepest stair with up to 75° inclination and therefore it is best choice for spiral staircases. A good planning allows boarding the lift safely outside the flight of the stairs. If the lift is not needed you fold him up and park him with minimum space requirements. Even if you need a lift on outdoor areas is our lift is ideally suited. By its enormous flexibility we will always find your perfect solution. 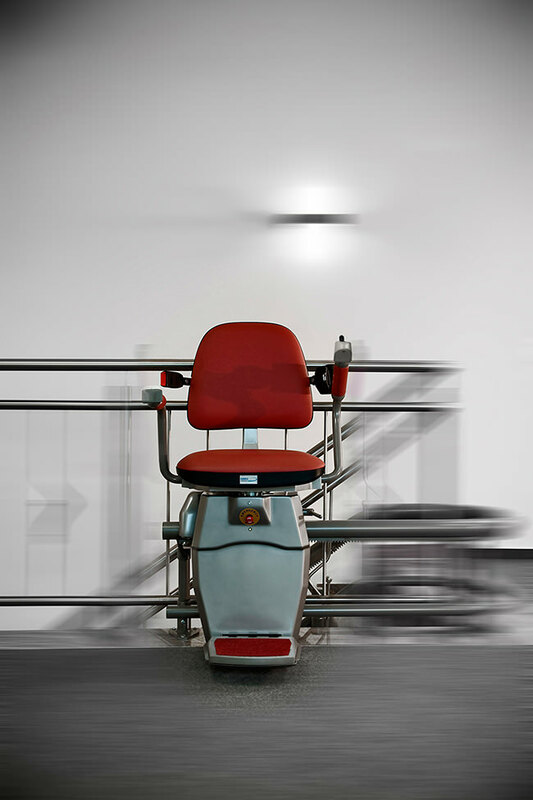 With the HW 10 our engineers created a stairlift which combines technical innovations with attractive design. So it is not only convenient, useful and reliable but even visually outstanding. They have elaborate construction and the used materials have the highest quality and trustworthiness. For distinct technical questions our team is always available for you. Stairs are not only inside a house. Sometimes they are even outside a big problem with a few steps only to the garden or the street. With our stairlifts which are especially designed for outdoor use are you able to keep your mobility. These outdoor lifts are assembled at our own factory and they are all perfectly fitted to your personal requirements. If straight or even curved stairs – our lift system perfectly fits everywhere and any time. Moisture proof seat surfaces, water resistant switches and a solid quality are defying in all weathers. So you are able to enjoy fresh air and vitality even with sun or rain. As the exclusive North American distributor for the Hawle custom curved stairlift, we are dedicated to the sales and service of precision state-of-the-art Hawle custom curved stairlifts. 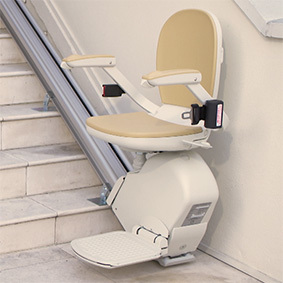 As the exclusive distributor of the only personal stairlift manufacturer with a European production, we would like to introduce you to Hawle Treppenlifte. Precision Stairlifts offers the full line of indoor and outdoor curved stairlifts manufactured in Europe by Hawle. 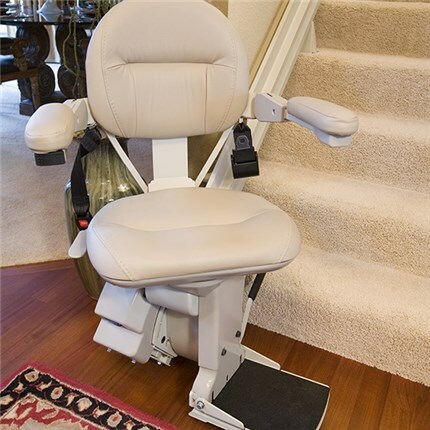 Each stairlift can be customized to your exact specifications. 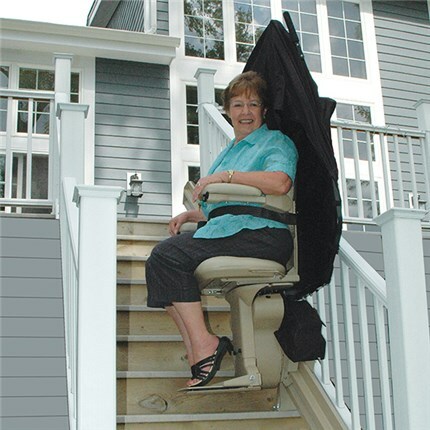 Sometimes called chair-lifts, stair-chairs, and elevator chairs, stairlifts are an easy and affordable way for those who have limited mobility to regain their freedom and independence within their surroundings, allowing them to remain in their homes and achieve better mobility outside as well. Our stairlifts can be custom-built to curve around corners and fit any stairway, whether it is for an indoor or outdoor application. Clients have the option of customizing their stairlift in the configuration that best fits their home design and needs. Precision Stairlifts can supply the perfect Hawle stairlift to match your decor and your requirements. 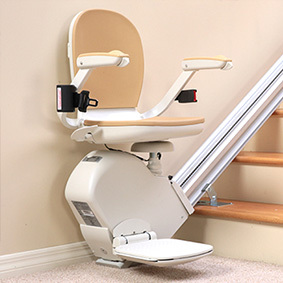 Stairlifts manufactured by Hawle, are the worlds most unique and reliable indoor and outdoor personal stairlifts designed even for steep stairs with a gradient of up to 75°. In designing Hawle stairlifts no concessions are made as far as safety and convenienceare concerned. The innovative construction and the superiority of the materials used ensure the highest level of quality and reliability in the industry. Hawle indoor custom curved stairlifts can be made in nearly any color. If you would like to have your curved stairlift rail one specified color and your stairlift carriage another, we can do that. Please look over our selection below for your custom stairlift colors. Our dealers can also provide color swatches of the many available fabric selections (leather, fabric, and vinyl options). We are truly unique to the stairlift industry in that we offer the world's BEST outdoor curved stairlift. The HW11 curved stairlift has a zinc-coated rail which makes it completely weatherproof. Our curved stairlifts can be made to your custom specifications. 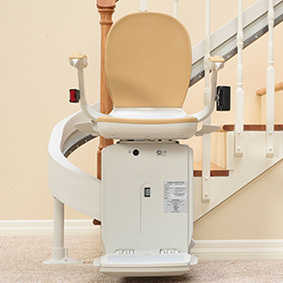 Our stairlifts make bends and turns that you cannot make with a straight stairlift. Since the rail is zinc-coated; you can choose the color of the stairlift itself and can choose which fabric and color choice you want for the upholstery. What colors are available for the indoor unit? There are over 220 available color options for the indoor unit and rail. Our Dealers can help you select a color scheme that will closely match the interior of your home. We recommend visiting www.ralcolor.com to view all of the color possibilities. What are my color options for an outdoor unit? The rail is coated in zinc for weatherproofing and cannot be painted a color. However, the chair itself can still have any color selected from the RAL color system. Please check with our Dealers to see the current selection of fabrics and vinyl padding available for your chair as well as which RAL color you would prefer for the unit. How fast does the stairlift travel? It travels at the speed of 19.68 feet per minute, which operates within the industry standard recommended speeds. 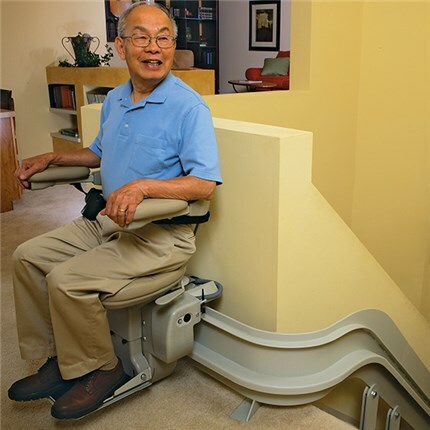 Can I use remote controls for the stairlift? Yes. 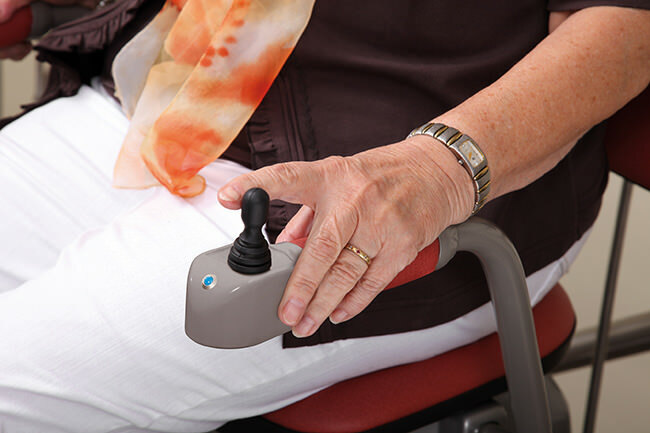 The stairlift comes standard with 2 remote controls that operate on radio frequencies instead of infra-red so that the unit can still be called if there is an obstructing wall or object. What are some of the safety features of the chair? All units are equipped with seat belts, an emergency stop button, and an overspeed safety device which is currently one of the only units on the market that offers this as a standard feature.